Religious accommodation disputes can lead to a variety of claims against employers. 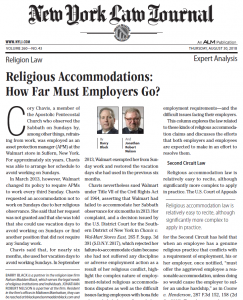 In their most recent Religion Law column for the New York Law Journal, Barry Black and Jonathan Nelson of the religion law firm Nelson Madden Black review and explain the law related to these kinds of religious accommodation claims and discuss the efforts that both employers and employees are expected to make in an effort to resolve them. The bottom line, according to Mr. Black and Mr. Nelson, is that, in many instances, there is almost nothing more important to an employee than his or her religious beliefs. The law recognizes that, and requires that employers do so as well – within limits.